The plan: Milan to Geneva by hitch and foot. The simplest, cheapest trip I could think of. 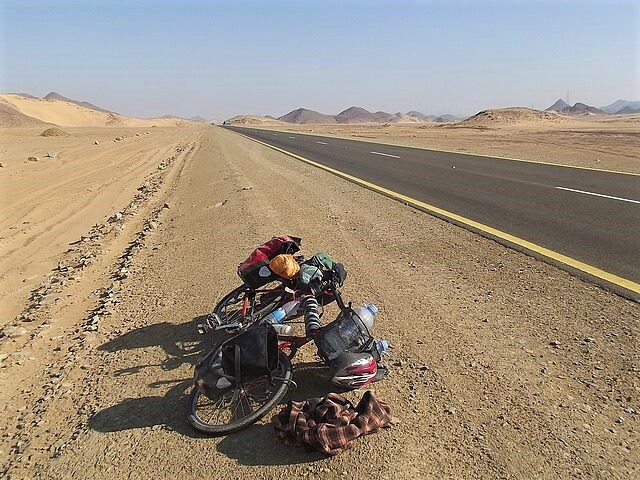 I booked the flights for less than a hundred pounds, bought some boots and convinced my mate Bo to join me - we would walk from one airport to the other, or at least try. We hadn't climbed mountains before and we weren't even sure that passing over the Alps and into Switzerland was possible. It was a book it and hope for the best sort of plan and it turned out to be some of the best weeks of my life. RAIN DROPS FELL TO MY FEET and the black road that moved beneath them, my eyes turned up. An Italian summer blue shone above and I realized, it was just me, raining sweat. Impossible sweating, fat Elvis on whizz sweating. 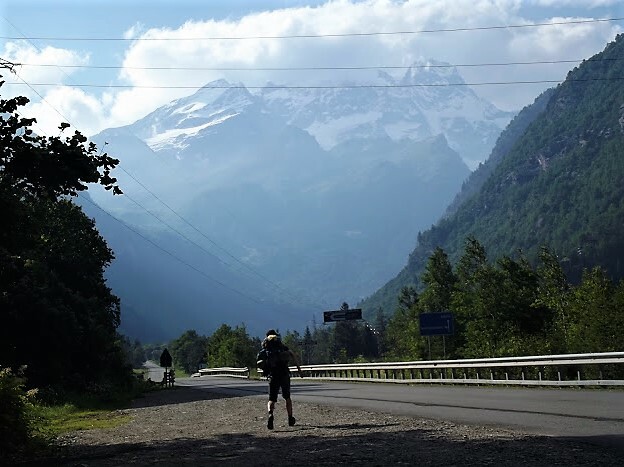 We tramped from town to village on a hot tarmac belt for four days in search of its end, to where the road turned to path and the Alps split the earth. Toes took a rhythm smack in box fresh boots and our normally dormant bodies quaked under the bags as flies swarmed our stink. And in those first doubting days as little Italian cars zipped past with a beep, our suffering seemed unnecessary. No exercise - ever - my legs complained like they wondered what was happening. But, we were on the road and we were happy. Days had no schedule. No time to check. A rolling moment that stretched the day longer than 'normal.' Decisions made without much thought, just walk, and where to sleep at night is a mystery, but not a worry. When the sun dipped behind the hills we turned from the road to a river bank and pitched home, rinsed out socks and hung them on branches and then lay around the stove as the river rushed on. The pot slowly simmered and we sipped a ration of whisky each and shared a cigarette. Electrical lights of fire flies floated aimlessly and our eye lids fell naturally with the darkening hills. LEAVING THE CITIES BEHIND THE LAND BEGAN TO BLOOM and on the fourth day walking the verge, a purple-blue wall of white topped mountains grew ahead. Road signs dripped past and at dusk on the fourth day, two sweat-wrecked men hassled by a million flies hobbled into town on the cusp of the Alps. The abrupt jump into straining travel had hurt and we nursed our blisters with beer and prepared for the dark barrier of peaks looming above. Rising at the crack of lunch, we put our best foot forward and immediately went the wrong way. Back tracking, a little brown trail split from the concrete and wound under the shade of pine trees and we followed it. The land opened as we walked: Broad green valleys singing with birds and life and scattered with bright little flowers. 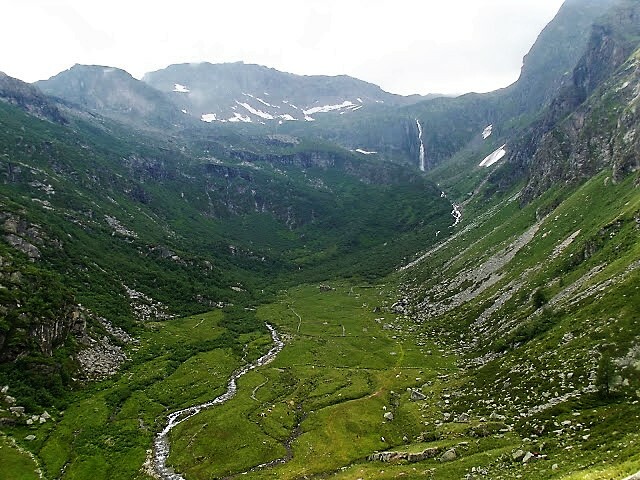 Green mountains swelled up like clenched knuckled split by white brush streaks of waterfalls, and we shouted out at the world like mad men fired with life. We hadn't climbed a mountain before and this beamed brightly obvious from the beginning. Striding keen and lengthy the path stopped abruptly at a little drinking fountain and so we abandoned the trail and headed across the valley in a vague northerly - Switzerlandy direction. We caught a group of school kids along a boulder littered flank that stole our heroics for a while and we asked the teachers for directions into the mountains; they wrinkled their noses worryingly. Hints of a path ran along the valley floor running parallel to a strengthening stream and without much debate we chased it. And wading through bushes and climbing boulders, the path faded away, but we climbed on blindly. Silver veins of water rushed past to our left and I stopped for a moment stood waist deep in ferns and traced the surge up the mountain: A waterfall burst from vertical iron-grey cliffs in the distance. Some time climbing and the cliffs leaned over us coldly uncaring to our efforts and we stared up like ants to the eternal roar of water falling down to us. Mist swirled in the air and a rolling rumble echoed off the walls and in my ears, every sense amplified. We had to climb, that's all we knew and the only way up was to cross the stream. Turning back down to find a safe crossing point sought effort we couldn’t muster and fuelled by the moment and the land around, I turned to Bo: a reckless mischief twinkled in his eye and we looked across the water plotting a boulder hopping route to the other side. And one slippery stone at a time, we jumped our way out into the white rush. My knees quivered and my rucksack wobbled as white water ripped around me; the unbothered honesty of nature is an excitement unmatched to mess with. I dwelled for a moment on the drop to my left - it blurred in the corner of my eye, almost tempting me in, but I fought to focus and from one slippery stone to another we made it across and waded up the banks. We walked on silent but grinning. The water rumbled on and faded behind and we stepped on into the mountains. "Is that a goat" said Bo, pointing up toward a huge concrete block building atop the nearest crest. Stepping up the slopes, the monstrous abandoned ski lift sat like an ugly spot on a beautiful face and in its doorway stood a little brown mountain goat watching us approach, its head tilted to the side in curiosity. As we neared, it hopped down the mountain and out of sight. Bo peered his head in the doorway, imitating the curious goat and checking for more inside. I wasn’t worried about goats, because they're goats, but Bo, who often gets drawn into a curious scavenge, banged his stick on the metal door and threw in a couple of rocks before deciding it was safe for an explore. I left him to it, dropped my pack in the dirt and sat to soak up the view, reflecting on our heroic river crossing. A noise I'd never heard Bo make before shot from the open door behind me, a yelp of real fear that slapped my dreamy thoughts - “AH! AH! AHHKIN ELLL!!”. I ran for the door - a split-second cowardice rushed my thoughts - whatever was going on in there, I didn't want to find out. A step away about to pile into the darkness with walking stick raised, when a flash of enormous horns and arching furry frame in perfect prance sailed past my face. I stood in shock for a moment. That was a big goat...”BO!! ?” I thought he’d been done, slaughtered by the horns of the beast, but then out he stumbled, eyes beaming like light bulbs - “AHHHHHH!!”. The dim crumbling tomb inside, littered with broken bricks and poo, was the home of an Alpine Ibex. As Bo intruded, a few yards into the den the beast appeared, standing on a ledge above him. Bo hit the deck as it leaped down towards him, but bounced straight off a wall and out the door, a yard away from ramming me in the face. After a busy first day in the mountains, we made camp in a grassy nook and made a fire with wood scavenged from the goat lair. The fire burned well and we supped a ration of whisky each under snowy peaks glimmering under a full moon. A splash of orange paint dotted on rocks show the way through the mountains. Clouds move in like a fast tide and swamp the horizons. Little holes in the clouds are like windows in the sky that look down at the separate land we've climbed from. The foot holes of previous hikers mark the snowy flanks and we follow them step for step through ankle-deep slush. A shining sweep of melting snow falls swiftly down to dark rocks below like a massive terrifying slide and one careful step at a time we pass safely through and climb higher into the clouds. I stare down at my plodding feet for a while and then glance up to notice the air has cleared and the beauty of the Alps is revealed. We walked for days from sunrise to sunset through a blur of stunning scenery and sweat. Within days we adapted to the life of the unshowered. Life became no more than walking a bit further, plodding through snow and gravel and wooded valleys a moment at a time until the sun was gone. Nothing happened quickly and it brewed patience. Our final day on Italian soil was fittingly beautiful. A winding trench-trail cut through bright spongy grass that tucked over the rolling land like a blanket. Gravel peaks flanked us and we hopped over twisting streams that ran like separate fingers down to bubbling rocky rivers. We walked all day and felt tired, but that was normal and we walked on, the world turning at a pace to be digested and remembered. 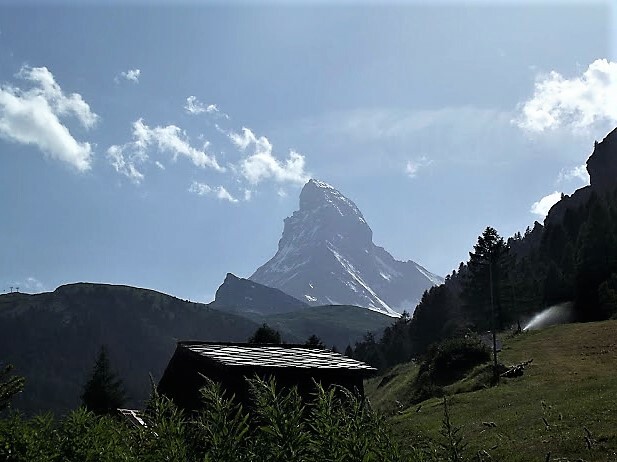 Late in the afternoon we crested a peak and took a double look up at the unmistakable grandeur of the Matterhorn Mountain. 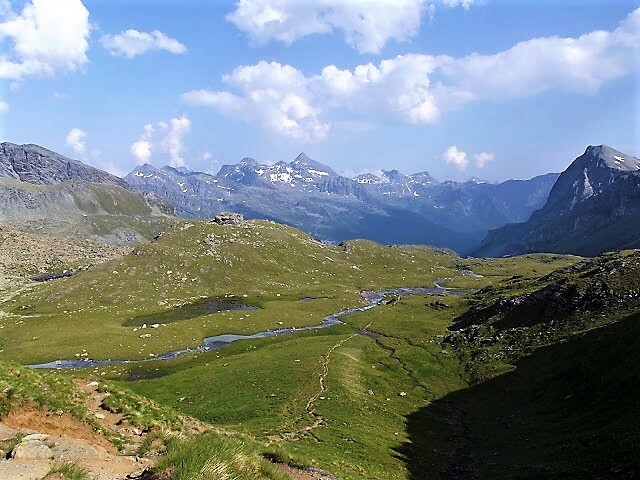 Progress across the map had been dismal and with our knack at taking the longest routes over mountains, we expected another two days or more on the path before reaching the end of Italy. The mammoth mountain ridge grew ahead and filled the sky. 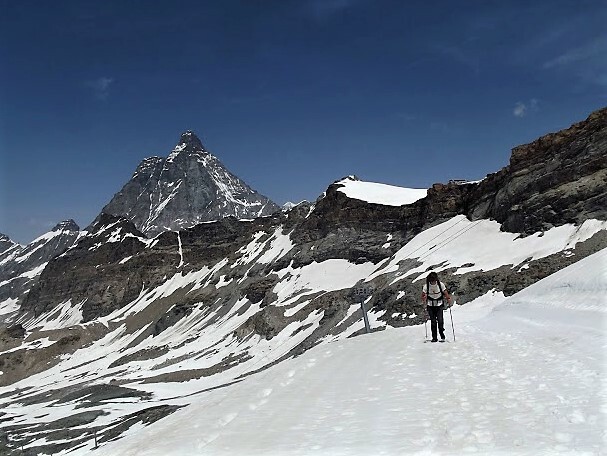 The single pyramid of the Matterhorn flexing high above the other peaks and we cheered and skipped on down the mountain to the village of Cervinia that lies in the belly of the beast. We walked too far in our eagerness and made camp on the edge of town with barely strength to hold a spoon. But we managed a beer and toasted to Italy beneath the dark peaks that lay like the spine of a giant; the last hurdle into Switzerland. 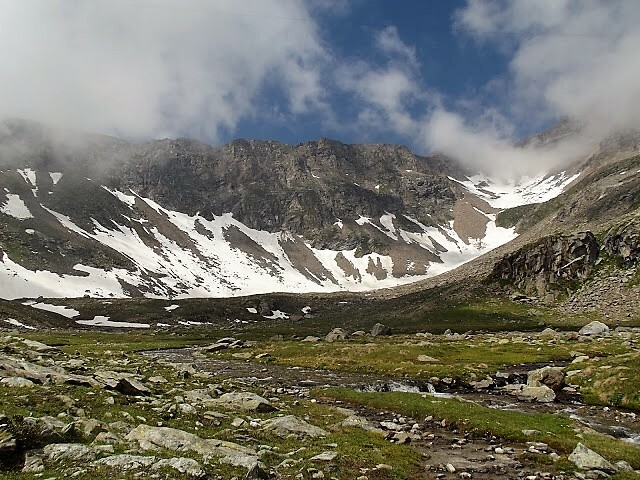 Next morning we stood on grassy flanks staring up to the ridgeline. Snow tilted up in a blinding glimmer to a thick blue sky that hung over Switzerland hidden behind. And then the sweat began. 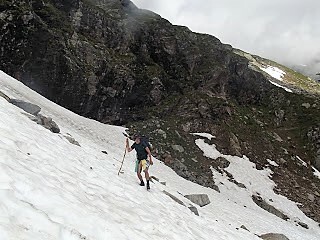 It was steep and we struggled through waist deep snow over the final hump and into the next valley, each foot slipping back into its previous hole, but as always, we made it through and sloshed on for hours down a sloping melt of snow and ice. 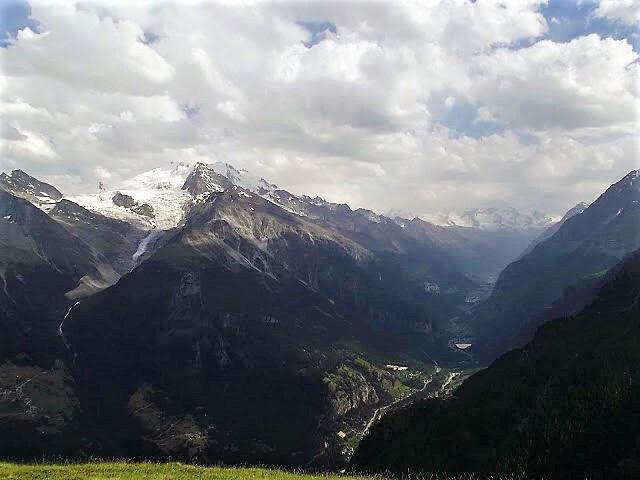 Feet numbed to the ankle, eyes squinted into the white world over pealing noses and ahead down the long unbroken slope, the Swiss Alps rolled on in a choppy sea of snow and black fang peaks.